When you think about it, you spend more time at your office than in your own home, not counting sleeping hours of course. Consequently, the atmosphere of your office, whether it be neat or disorganized, will greatly affect you and your employees in a myriad of ways. Therefore, learning how to keep your office clean is important. Before getting to the cleaning tips, though, let's look at why a clean office is imperative. Unprofessional: If your office is cluttered, dusty, or generally disorganized, you will instantly appear less professional to clients/customers. You might say, "I'm too busy working to clean up after myself." Well, consider the appearance of your office as you would your own. Would you come to work in your bathrobe simply because it took more time to get dressed? Less Productive: Running a successful business is all about productivity. Getting things accomplished is the end goal. If you spend an hour looking for a particular folder under piles of other files and perhaps old take-out cups, is that a productive way to do business? Of course, it isn't. By not having a place for everything and keeping everything in its place you are actually wasting billable hours. Can Make You Sick: A dusty, dirty office can also cause sickness in a person who has a sensitivity to dust or allergens. Therefore, as a business owner, you might lose a part of your team to sickness simply because your work environment isn't healthy. This reduces productivity simply by cutting down manpower. "Cleanliness and order are not matters of instinct; they are matters of education, and like most great things, you must cultivate a taste for them." This quote exemplifies the importance of cleanliness perfectly. It also reminds us that cleaning isn't always instinctual. That's why a checklist of sorts is as worthwhile as a guide on whipping your office into shape this spring. This is relatively easy; it just takes time. Simply go through your desk and throw away the trash. It sounds simple, but it's amazing how many people don't do this basic step. Get rid of/recycle old water bottles, carry-out cartons, and drinks. Also, donate or throw away anything you don't use or that doesn't work. Why keep a calculator that doesn't function properly or hang on to a pencil that's too small to write with? Simply getting rid of all the stuff you don't need or use on and around your desk will help immensely. 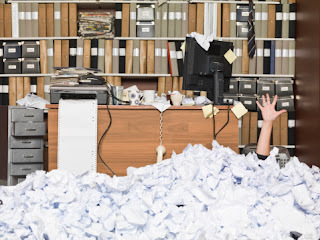 As you know, paperwork is never ending, and if you don't have a great file/shred system in place, it can really get out of hand. Part of cleaning off your workspace should include going through and shredding documents you no longer need. If you do need to keep something, create an easy-to-follow filing system to get these files off your desk. This tip should be taken literally, as in taking your computer apart and dusting it with the proper tools, as well as metaphorically. Clean the inside of your computer by deleting old emails and archiving those you need to keep.It's also a great time to back up your server if you have one or update old software. Excellent spring cleaning tips, it’s really helps to make my environment too fresh & clean. Can you update some advanced cleaning tips to kick out the irremovable dirt? Excellent Cleaning tips, Thanks admin for sharing an amazing cleaning hacks. Do you want to keep your home clean and fresh? It's very simple and easy. Search for one of the best cleaning services deals Calgary online to keep your house clean and fresh during a family gathering or a party. Nice article, Which you have shared here about the Spring Cleaning. Your article is very informative and useful to know more about the office cleaning in the spring season. If anyone looking for the Local Commercial Cleaning Services in the Richmond Hill, Superrun Cleaning is the best for you.